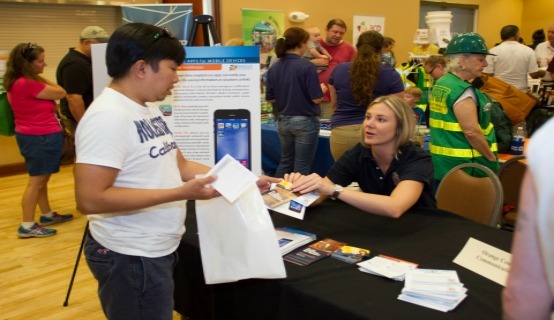 More than 1,500 citizens learned how to prepare for hurricane season and received free storm supplies at Orange County’s 2016 Hurricane Expo in June. “Review, Reboot, Be Ready!” was the theme of this year’s expo, which was held at the Renaissance Senior Center. Orange County District 4 Commissioner Jennifer Thompson welcomed citizens to the expo and spoke about the importance of hurricane safety. During the event, several Orange County offices and partner agencies educated citizens on how best to protect their homes from the potentially devastating effects of unexpected storms and severe weather. WFTV Channel 9 Meteorologist Tom Terry met with citizens and shared information on weather conditions before and during a storm. It is vital that citizens put together a detailed safety plan for their families and pets to prepare for the season. Information hand-outs and live demonstrations educated citizens on the best way to track storms, how to pack a disaster kit, first aid administration, and planning for pets during severe weather. Orange County also distributed emergency radios, first aid kits and flashlights to citizens. The forecast for the 2016 season predicts four to eight hurricanes and 10 to 16 named storms. The Atlantic Hurricane Season began June 1 and ends November 30. Disaster information during a storm can be accessed by downloading Orange County’s free smartphone applications. OCFL Alert provides open shelter locations, water and ice distribution centers, evacuation routes, public service announcements and much more. The OCFL News app provides breaking news and the OCFL 311 app allows users to photograph, pinpoint and report any problem encountered before, during or after the storm directly to Orange County’s 311 Service Center. OCFL 311 also maps relevant community information that may impact neighborhoods. Citizens can also register for the OC Alert system, which sends emergency alerts, notifications and life-saving instructions via text message to cell phones and email accounts. For more information on preparing for the hurricane season, visit Orange County’s online hurricane guide. To view photos from the 2016 Hurricane Expo, visit Flickr.